The Connie Burwell White and William W. White Foundation was created in 1984 to support education, the arts and human welfare in the Denver metropolitan area. Connie Burwell White was born in Charlotte, NC. She attended Sweet Briar College and the University of North Carolina, where she earned her doctorate in philosophy in 1937 and was the first female teaching member of the philosophy department. After four years as a professor at Queens College, Connie launched a career in journalism as a researcher, editorial assistant and foreign correspondent in England and Brazil for Time, Life and Fortune magazines. William W. White was a Boulder native and graduate of the University of Colorado School of Journalism. He worked as a reporter for the Rocky Mountain News, Boulder Daily Camera, Denver Post and, in 1938, was named a regional correspondent for the Associated Press in Washington D.C. After a stint with the New York Herald-Tribune, William served as a London-based correspondent for Time Magazine during World War II with legendary colleagues Edward R. Murrow and Ernie Pyle. Partners in business and life, William and Connie were married in 1945 and founded White & White, Inc., one of Denver's first public relations firms, in 1955. For more than 30 years, the firm represented many of Colorado's most important companies and civic institutions. The Whites were also active community leaders, serving on the boards of organizations such as the Denver Art Museum, Denver Botanic Gardens, St. John’s Cathedral, Denver Chamber of Commerce and the Junior League. 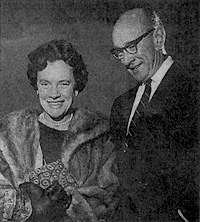 William W. White passed away in 2001; Connie Burwell White passed away in 2008. The White Foundation serves as a lasting legacy to their devotion to the Denver community and one another. Photograph by Larry Johnson. Available under a﻿ Creative Commons﻿ Attribution license.